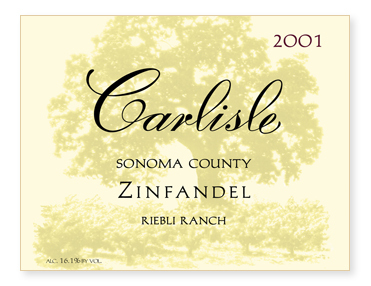 Planted in 1906, this vineyard is predominantly zinfandel but with a hefty dose of Petite Sirah. It lies just outside of the Russian River appellation in the hills northeast of Santa Rosa. The vineyard is totally organic. Even sulfur dust, permitted in organic farming, is not used. With tiny, loose clusters and berries the size of small peas, yields were pitifully low in 2001, at about one third ton to the acre. But what beautiful fruit it was! After a 5 day cold soak, the must was inoculated with one of our favorite yeasts, BM45, a slow moderate fermentor. After 21 days on the skins, the wine was pressed directly to French oak, 33% new. After 16 months in barrel, the wine was bottled unfined and unfiltered.